If have not installed Windows 10 already, I bet you the time is now so brace yourself to witness some of the best new features Windows 10 is adding to their flagship Operating system during an anniversary of its release. Don’t forget you heard it on Tech Habor first. The Anniversary Update for Windows 10 is just around the corner and it’s packed with all kinds of new features. Microsoft is emphasizing the improved Windows Ink functionality, as well as beefed-up Cortana features. But what are Windows 10 users themselves most excited about? To find out, we scoured forums on the Internet, posted inquiries on social media, and even asked for feedback via email. So here, in no particular order, are the features that have Windows users most pumped. What you see below might surprise you, and it just goes to show that often it’s those nice little touches that improve a user’s experience that get the biggest reaction. 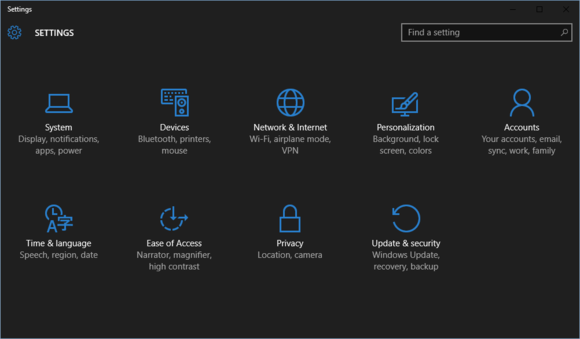 The Windows 10 Settings app with the dark theme enabled. Forget about fancy features like a souped-up Cortana, or power-user craziness like built-in Bash. The recurring feature mentioned by many people online is one-click access toWindows 10’s dark theme. Prior to the Anniversary Update you had to dig into the registry to turn on the dark theme. The bad news is that the dark theme isn’t all that exciting. It only works with Windows Store apps, and only those that support it, no less. That pretty much means you’ll see the dark theme in built-in apps like Settings, Store, and Calculator, the Skype universal app, and Twitter. But hey, when it’s active, those dark apps are pretty sleek. I didn’t even know this was a thing in the Anniversary Update, but it just goes to show how many little niceties are hidden away in this upgrade. When the Anniversary Update hits, you’ll be able to see your system clock on all your monitors that show the taskbar. Prior to the Anniversary Update, the system clock could only be on one monitor. Windows Hello lets you log into a Windows 10 device using face-detection, fingerprints or an iris scan (if you have the proper cameras and scanner hardware). The Anniversary Update is adding Hello support for third-party apps and some websites, with more hopefully signing up in the future. That means logging into Dropbox with your face instead of having to remember [email protected]$$word!. This one comes special from Reddit, and I don’t mind admitting that I too am particularly excited about this change. Microsoft’s NTFS filesystem will now allow filename paths (file location) to have more than 260 characters. I know, I know, you’re wondering why anyone would care about that, and it sounds like a ridiculous thing to be excited about. But if you don’t understand then you’ve obviously never tried to manually restore your personal files from a cloned backup of your system. When you do that, you can easily navigate into file structures that are well over 260 characters, which hangs up your restoration process. The NTFS character cap will still be enabled by default, however, and requires users to change settings in the Group Policy Editor or the registry, depending on your version of Windows. With the Anniversary Update Microsoft Edge is closer to being a browser people want to use on a daily basis. The successor to Internet Explorer is finally getting extensions. At launch there will be a limited number of extensions, such as LastPass, the Reddit suite, and AdBlock Plus. 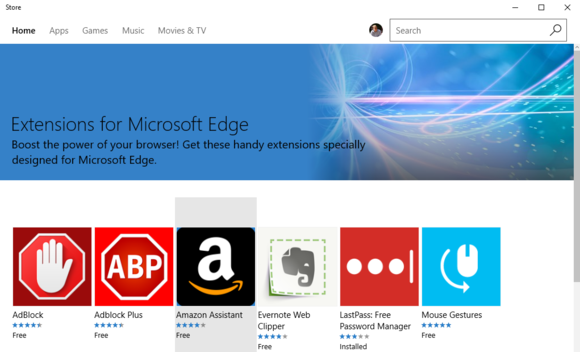 Extensions will be available via the Windows Store. Bash running in Windows 10. It doesn’t top the list, but power users are truly excited about interfacing with their Windows machine from the Unix-y Bash command line. Bash is being imported to Windows straight from Ubuntu, the Debian-based Linux operating system. This isn’t some kind of virtual machine running inside your Windows system, however. 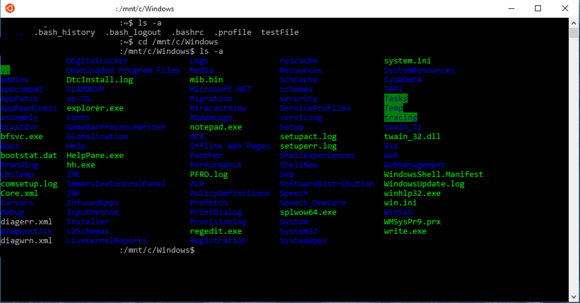 Bash is available to Windows natively via a new feature called the Windows Subsytem for Linux (WSL). To enable Bash you’ll need to dip into the Settings app and enable developer mode. You’ll also need to download Bash from the Windows store (via the command line, natch.) Check out our earlier tutorial on how to enable Bash in Windows 10 for more detailed instructions. After the Anniversary Update, Windows 10 will have far better integration with Windows 10 Mobile devices and Android phones running Cortana. Mobile notifications from apps and messaging services will show up on your PC and be integrated into the Action Center. With the Anniversary Update, the Windows 10 Action Center is becoming your PC’s “center of action,” or at least that’s what Microsoft claimed in a June blog post. The new version of the Action Center offers richer notifications that can include images—such as Cortana photo reminders. Web notifications via Microsoft Edge will also show up in the Action Center, and your phone’s notifications will appear if you use Cortana on either a Windows 10 Mobile or Android device. There will also be more granular controls for notifications such as specifying the number of full notifications you get from each app, and the ability to turn off notification banners on a per-app basis. A small but incredibly useful change. The Anniversary Update will integrate the Calendar app with the calendar in your taskbar. This means when you click on the date in the taskbar and you see a monthly calendar pop-up, right below that calendar will be your appointments. All you need to do is make sure you connect your various online accounts with the built-in Calendar app. Those are some of the highlights from Windows users online, but don’t forget that the Anniversary Update also offers other improvements. Check out our earlier look at the highlights of the coming Windows 10 upgrade for more details, and don’t forget to read up on everything else you need to know about the Windows 10 Anniversary Update. Previous article SSD vs. HDD: What’s the Difference?